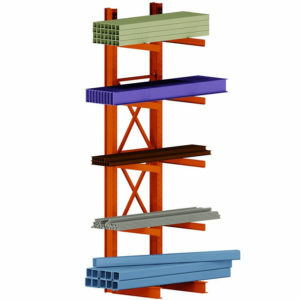 Factory Direct New Cantilever Racks Ready to ship! 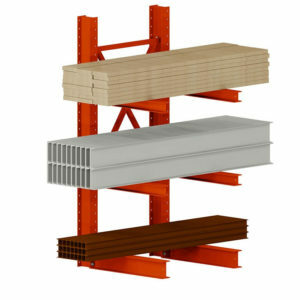 Cantilever racks, also known as lumber racks, pipe racks, or bar storage racks are a popular choice for industrial storage and are in high demand. 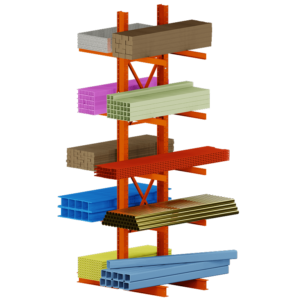 Buying used cantilever racks can be a solution when you are looking to save money vs. buying new. 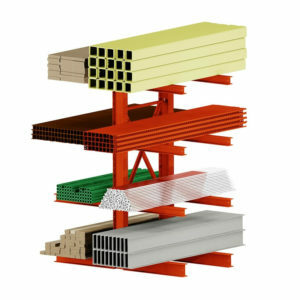 Used cantilever racking systems can work just as well as new cantilever racks and are available in a wide range of sizes and strengths to suit all types of industrial storage needs. New Prices Cheaper Than Our Competitors “USED” Prices. Many Sizes In-Stock for Quick Delivery. Short Factory Lead-Times If We Don’t Have What You Need In-Stock. 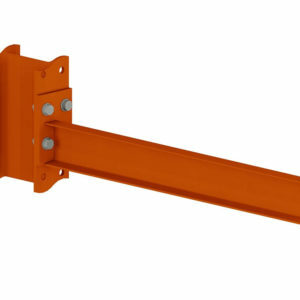 Heavy Duty Structural Steel & High Quality Powder Coat Finish. CALL US TODAY and one of our trained salespeople will be happy to assist you in the design of the right system for your particular storage application. 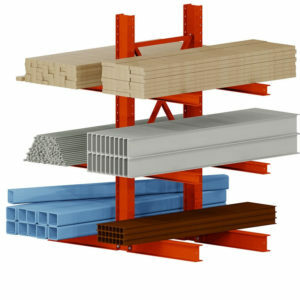 Cantilever racks are a great storage solution for organizing your operation and freeing up your floor space. 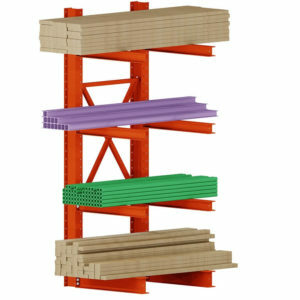 Composed of uprights/towers & bases and cantilever arms, these types of racks are great for storing your long and bulky products. 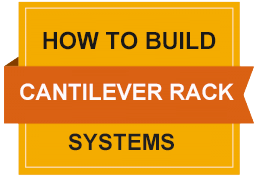 Your cantilever rack system will start with a starter kit or often called a starter bay. Starter kits come in single and double sided variations. A single sided cantilever starter kit consist of Two (2) cantilever Uprights/Towers, Two (2) cantilever bases, x-bracing to provide lateral stability to your cantilever rack system and finally cantilever arms that will support your products. 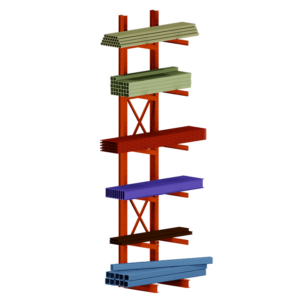 A double sided cantilever bay has Four (4) bases and allows you to store products on both sides of the system. Once you have your starter kit, next you use a cantilever adder kit to lengthen your system. Based on the length of the products you wish to store, you simply add additional adder kits as needed. The on center dimension of your towers is set by the width of your cantilever X-brace sets. These typically come in 2 foot increments but can be custom built to whatever size you need. 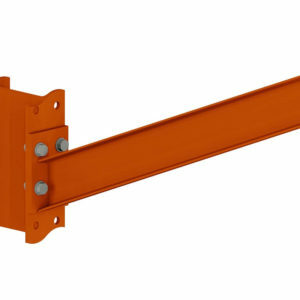 You can also use an inclined cantilever arm for storing round items such as piping. These arms are set at a 22 degree pitch to prevent your product from rolling off the cantilever arms. 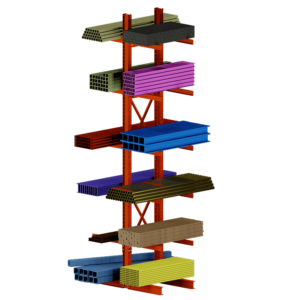 Cantilever rack pipe stops are also available and can be installed on a straight cantilever arm to allow the flexibility of storing both flat and round products within your rack system. This pipe stop is removable as needed based on the type of products you are needing to store.